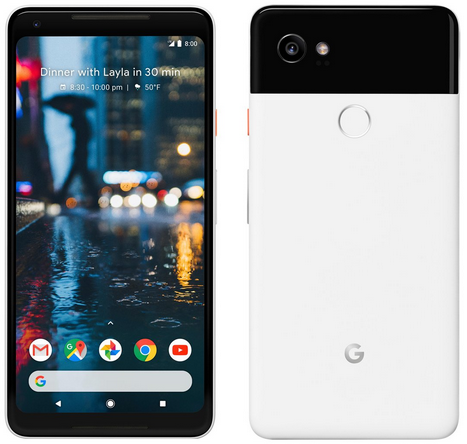 Google Pixel 2, Pixel 2 XL Images Leaked to Reveal Their Design - Playfuldroid! Well-known tipster Evan Blass has leaked couple of images of the Pixel 2 and Pixel 2 XL smartphones that are slated to get unveiled on Oct. 4. The Pixel 2 and Pixel 2 XL are respectively manufactured by HTC and LG. However, these phones are going to be sold as “made by Google” devices. In the above image, the frontside of the HTC-made Pixel 2 can be seen on the extreme left followed by its three color variants such as Clearly White, Just Black and Kinda Blue. These variants show the two-tone design on the rear panel. The front view shows that the handset features thick bezels at the top and bottom. The dual front speakers can be also seen and the sides are slim. Previous reports have revealed that the 64 GB and 128 GB Pixel 2 models will be respectively priced at $649 and $749. The above images belong to the LG-made Pixel 2 XL. These images show that the Pixel 2 XL does not sport very thin bezels. Rumors hint that it will offer a screen-to-body ratio of around 80 to 85 percent. It seems to sport a near-bezel-less display like the LG V30 and it also features dual front speakers. The 64 GB and 128 GB models of the Pixel 2 XL are rumored to be respectively cost $849 and $949. It is expected to arrive in colors like Just Black and Black & White.